Lush tropical gardens invite you to stroll around in the shade of giant trees across bridges onto islands containing all kinds of strange animals. 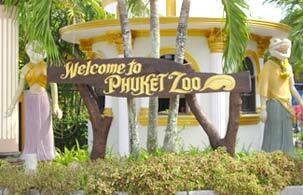 There's hours of fun at Phuket Zoo, come and have a look. New species of fish, birds and other animals are acquired each year as well as young from our various breeding programs. We exchange animals with other zoos to get rid of excess stock and bring in new blood. New developments are coming to Phuket Zoo soon. We recently opened our new aquarium and next will be the Bird Show in its own purpose built building. We look forward to seeing you soon.  Amazing elephant shows 10.30 a.m. , 1.30 p.m. , 4.00 p.m.
 Lovely monkey shows 9.00 a.m. , 12.00 a.m. , 2.30 p.m. , 4.45 p.m.
 Crocodile wrestling shows 9.45 a.m. , 12.45 p.m. , 3.15 p.m. , 5.30 p.m.